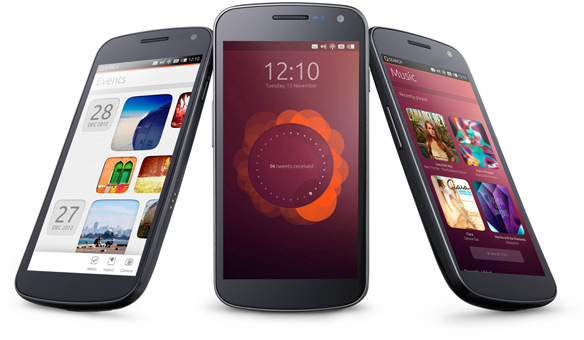 As Canonical co-founder Mark Shuttleworth revealed the latest news about Ubuntu’s mobile plans on Wednesday, he also dropped an interesting aside remark about Apple(s aapl). “Apple just snapped up the entire 3-year supply of the same sapphire display we wanted for the Edge,” Shuttleworth said on a conference call. This is a reference to the Ubuntu Edge, a flagship handset for the mobile device that broke crowdfunding records but ultimately failed to meet its target, so it never got made. We’ve heard similar reports earlier this month that estimated that Apple had bought enough supply for 200 million sapphire iPhone screens. What’s interesting is that the Edge was to have a 4.5-inch display. The current iPhone 5s has a 4-inch display that is more elongated than the more traditional proportions of what would have been the Edge’s screen. To confuse matters further, rumors are currently floating around of Apple buying sapphire displays but at a size of 5.6 inches, for a phablet-style device that won’t use the iPhone branding. So in that context, Shuttleworth’s very clear assertion doesn’t make much sense, but it’s probably worth noting nonetheless. Apple also uses sapphire for its Touch ID sensor and if it is going to make sapphire displays, they’ll likely be produced in Phoenix, Arizona, where Apple recently invested $578 million in a solar-powered production facility. Apple is expected by some to offer an iPhone later this year with a screen between 4.5- and 4.7 inches, although that display is not expected to use sapphire; instead, it would use Corning’s(s glw) Gorilla Glass like the current iPhone does. Apple is NOT going to make sapphire displays. They have never made a displey before of any kind. They buy displayd from Samsung, LG and maybe some from a couple of the Taiwan based companies like chi mei inolux or AU optronics.. Apple has no factories. Just like Samsung made the memory for Apple, the batteries for Apple, they produces the SoC for Apple and so on. And it was all assembled in China by Foxconn. They may buy the equipment to make the ingots, and put the equipment in a Foxconn factory in China for example. But I don’t see why they want to do that. All the solar companies that can grow silicon ingots can add equipment to grow sappire ingots.. and they already have the diamond saws to process the ingots to the wafer thin slices they need to make superior screens and camera lense protection. It will first be available to the high end phones – but the cost of making the screens will drop. As the sapphire crystal growth furnaces cost between 70 – 700 000 dollars, it is a market that will grow. The only reason we don’t already have sapphire glass on all high end phones it because of the massive growth in the LED business, that scooped most of the worlds sappire production equipment since 2010. Growing sapphire crystal ingots use a lot of electricity/energy since they have to heat the alumina to about 2000 degrees C. Then they will pull the and rotate to make the ingot. Then it will be cut to a block, and then to proper size – and then sliced to wafers. And then it will be further processed. Gorilla Glass will be used for medium to low end smart phones, and even some feature phones. I know a feature phone that will feature sapphire display protection in 2015. A small device that is made for pockets. Will the new iphones have a sapphire touch display? Yes, and that will all the other phone/phablet/tablet manufacturer have too. But tablets over 8 inches will cost.. at first. 1/ Apple has REAL, physical products, that actually *exist*, and which they have sold hundreds of millions of, for YEARS. 2/ Apple don’t sell pipe dreams and thin air; they research, develop, manufacture and build stock levels THEN sell those products (the real ones, you know?). 3/ Apple has a immensely solid history of producing unbeatable experiences in their products, whereas Canonical lack focus almost as much as Google (they couldn’t even get something as simple as cloud storage right – noone trusts you any more, guys). 5/ Why would a sapphire production plant put a HUGE order for a multi, multi, multi, multi-billionaire WORLD WIDE visionary, industry leading company at risk, for a niche geek device which doesn’t even exist yet – would you? Don’t be ridiculous, Mr Shuttleworth. 6/ Apple are likely patenting their future implementations of sapphire display technology, so noone can waltz in and copy it, which is likely to happen with companies like Samsung around (sorry, I meant to say – they may be a laughable company, but they also have MANY BILLIONS of dollars too – if it weren’t for risking copying another Apple patent, I think the sapphire plant would put them wayyyyyyyyyyyyyyyyyyyyyyyyyyyyyyyyyyyyyyy before you in the queue). You guys just don’t get it, talking about Apple going to use sapphire… Apple won’t use those screens, they just don’t allow a new competitor on the market so they just buy the whole supply so it can’t be used. Apple arrogance. This expensive display may only be available on a more expensive model of the iPhone unless apple keys into breakthroughs in display coming soon. Apple runs the risk of catching up into a totally obsolete display technology unless they remain flexible regarding new awesome tech brewing within the next year. Ruby is for wearable devices as in ‘wrist notifier’, that can withstand a journey through your washer/dryer, a swing against a brick wall, etc. Your notifier device will last a long time, because the real smarts are in the phone , just like the old iPod that used the Mac (and PC) for the purchasing and playlists. The move to sapphire display technology is very exciting. Screens made of this material should be really resistant to damage and might be a dream come true for those of us who use screen protectors to protect our screens, while wishing we didn’t have to. I would not get excited about this sapphire news. It sounds like another “later this year” or “wait until next year” from Apple. Maybe Apple should acquire the Chicago Cubs they have a lot of experience telling the world to “wait until next year”. Until Apple really steps up there R&D spending to be competitive with Samsung, Microsoft, Google, etc they are always going to be playing catch up with market share. Apple has been spending just 2% on R&D while the other large tech firms are spending 105, 11% , 16% and more to support existing products,develop new products, and spark innovation. 10%, 15% on R&D….who care ? … focus is also the way to go with advertising, also. Samsung fans fancy that Apple’s successes are all due to their extensive “Marketing”. Only, Samsung substantially outspends Apple in advertising. I see what you are saying, but I think there’s a point to be made by looking at those statistics. They don’t spend as much, but they don’t necessarily have to. They focus on a few specific areas and try to do them well. Samsung makes pretty much anything and everything. Google dabbles in some really out there “moonshot” concepts. Microsoft is trying to turn itself around and needs to figure out what it wants to be. Bigger companies with a larger array of products will need to spend more in many areas, including R&D. Apple’s focus is on making the best, not the most (as they’ve said over and over). Apple seems to be gearing up for sapphire displays for the next phone, however, even if it isn’t ready for this year it will be a great feature for iPhone users, in my opinion at least. As has been proven over and over, Apple is almost never first, but arguably does the best job of integrating and simplifying existing technology for most people (TouchID is a prime example of this). It’s focus is the user experience. If it isn’t up to par, they’re not afraid to shelve it and wait until the technology is ready. Some people are bound to complain (myself included sometimes – the wait for LTE was painful), while others are perfectly happy to wait it out. I think it is the other way around for Samsung. How many % do Samsung need in R&D for dishwashers and vacuum cleaners? In those markets, I do not think you can spend 10% on R&D. This should bring the total R&D as % down for Samsung.